Participate in the activities happening or add your own event. Check out our list of ideas on how you can celebrate. Plan an event using our templates. 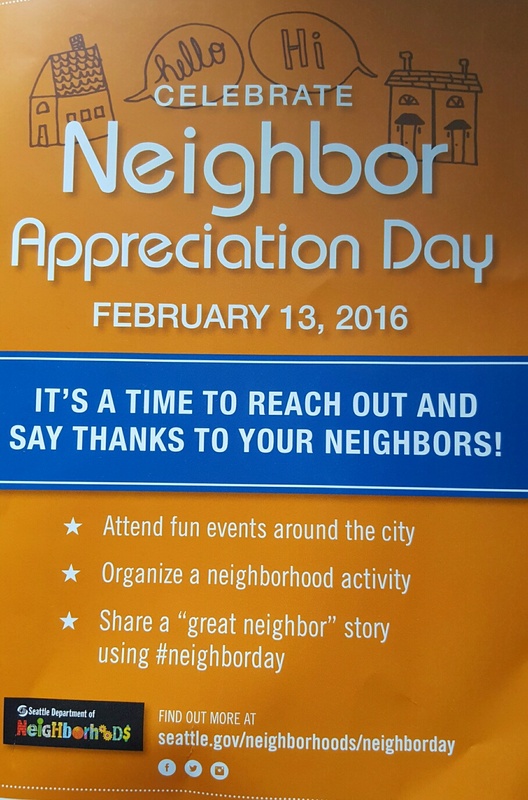 Share your story of a “Great Neighbor” using #neighborday on Facebook, Twitter and Instagram. History: In 1995, Phinney Ridge activist Judith Wood suggested that the City designate “a special day to celebrate the goodness in those around us and to reach out and strengthen our bonds to each other.” Mayor Norm Rice proclaimed the Saturday before Valentine’s Day as Neighbor Appreciation Day, and the observance has grown every year since. Celebrate Neighbor Appreciation Day–Join the hundreds of community members across our city in celebration of what makes Seattle great – our neighbors!